Gmail Conversion is now possible even after creating backup for your Gmail account by just investing in the authentic Gmail Backup software which is developed with the finest algorithm which help user in creating backup and then help them in Gmail conversion. Backup Emails in PST, MBOX and EML file format. Contact Items can be backed up in VCF file format. Calendar Items can be backed up in ICS file format. Documents Backup Save into orginal file format. Learn The Process of How to Make Backup of Gmail Account? Now a day's every third person is using Google services to store their crucial data in their Gmail account. And to protect their data from unwanted loose user need to make backup of Gmail email data. Once user lose their Gmail data they might lose all their contacts and might suffer badly, to overcome this situation they can use our Gmail backup tool to create backup for their crucial data. Our Gmail conversion tool is developed with the sheer technology which help user in creating backup and then allow them to export or convert Gmail to EML, MSG, MBOX or PST file format easily. 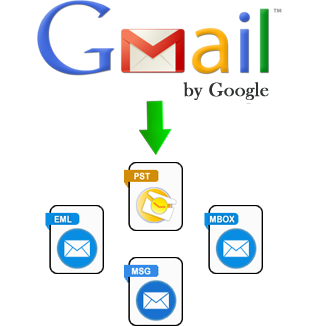 Our Gmail conversion tool is one of the easiest third party solutions which can do Gmail to PST, Gmail to MSG, Gmail to MBOX or Gmail to EML conversion so that user can easily access the Gmail backup. User can install the named application with any version of the Windows smoothly and if users are facing installation issue they can overcome them by using user interface guide. Every user wants to protect their data from unwanted loose, whether they know any technicalities or not, those users can also create their data with our software without facing any problem. This named application is one of the best solutions to create backup of Gmail account in few seconds as compare to the other application available in the software market. To assure Gmail conversion tool working user can dependably download the application demo version. With this edition of the Gmail conversion software user can make backup of 100 email items & 25 other items like contacts, calender & document from Gmail and can convert Gmail to PST, MSG, MBOX or EML file format according to the wish of the user.